HELENA - As Sen. Max Baucus has taken the lead on health reform legislation in the U.S. Senate, he also has become a leader in something else: campaign money received from health and insurance industry interests. In the past six years, nearly one-fourth of every dime raised by the Montana Democrat and his political action committee has come from groups and individuals associated with drug companies, insurers, hospitals, medical supply firms, health service companies and other health professionals. These donations total about $3.4 million, or $1,500 a day, every day, from January 2003 through 2008. Baucus, who chairs the Senate Finance Committee, which is drafting a major health care reform bill this month, insists that this cascade of money is not unduly influencing his work. "No matter the issue, Max always puts Montana first," said his spokesman, Ty Matsdorf. "Max will continue to do what's right for our state, and groups like SEIU (a union representing thousands of health care workers) and AARP (a senior citizens' group) wouldn't line up in support of his health care reform effort if this wasn't true." Baucus' office also lists numerous examples of how his proposed reforms are challenging the health care and insurance industries, such as requiring insurers to accept all customers, regardless of health condition. Yet some reform activists and others who watch the political system say it's foolish to think this money doesn't hold some sway. "When you spend so much of your time raising money, as members of Congress do, from those who have a compelling interest in the outcome of legislation, it has to change what you think about it, and the viewpoints that you have," said David Donnelly, director of Campaign Money Watch, a Washington, D.C., group that tracks money in politics. "It's just human nature. … and members of Congress are human." Advocates of national, public health insurance for all - a proposal largely excluded from the health reform debate - say their exclusion points to the power of moneyed interests in Congress. "I'm convinced that this (money) has a profound influence," said Quentin Young, national coordinator for Physicians for a National Health Program. "Otherwise, how could Baucus, an otherwise respected and wise politician, say categorically that single-payer (national health insurance) is off the table?" Only Baucus' Republican counterpart on the Finance Committee, Sen. Charles Grassley of Iowa, rivals him in terms of percentage of funds from these business sectors. 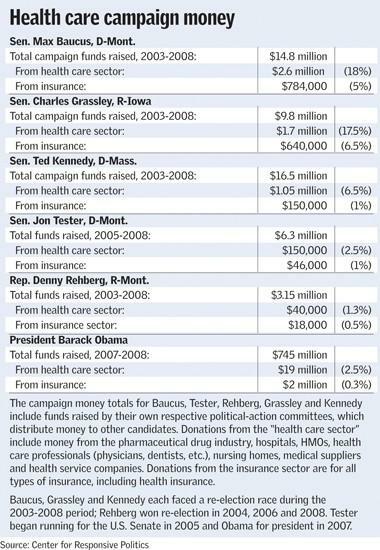 The Gazette State Bureau examined fundraising data for Baucus, Grassley, Sen. Edward M. Kennedy (who chairs the Senate Health Committee, which is drafting health reform legislation), the other two members of Montana's congressional delegation, and President Barack Obama. n From 2003 to 2008, the Baucus campaign and his Glacier PAC, which raises money and distributes it to other candidates, received 23 percent of their $14.8 million from health care and insurance interests. The $3.4 million from these sectors includes $853,000 from pharmaceutical and health products, $851,000 from health professionals, $467,000 from hospitals and nursing homes, $466,000 from health service and HMO interests, and $784,000 from insurance. The insurance sector money includes donations from all types of insurance company interests, including health insurance. • Five of the top 10 specific donor sources for Baucus were drug companies, health insurers or health-related firms. For example, employees of Schering-Plough Corp., a major drug firm, gave him $92,000 over the period, more than any other single source. • Grassley, the highest-ranking Republican on the Finance Committee, received 23.5 percent of his funds from health and insurance interests but a lesser dollar amount than Baucus ($2.3 million out of $9.8 million total funds). • Kennedy, a Massachusetts Democrat and a longtime advocate of health care reforms, received only 7.5 percent of his funds from health and insurance interests, or about $1.2 million. • Sen. Jon Tester, D-Mont., and Rep. Denny Rehberg, R-Mont., had minimal contributions from the health and insurance sectors. • Obama, whose campaign raised a whopping $745 million in 2007 and 2008, received a relatively small share from health care interests ($19 million, or 2.5 percent) and insurance interests ($2 million, or 0.3 percent). Baucus has been leading the charge on health care reform in the U.S. Senate since early 2008, holding numerous hearings and Finance Committee meetings on the issue. He released a lengthy "white paper" last November, outlining his reform ideas, and a major bill is expected to be introduced this month. The general thrust of his proposals is to require all citizens to buy health insurance while also forcing the private insurance industry to stop practices that make coverage unaffordable for many. He supports subsidies to those who may have trouble affording insurance. However, on a reform bitterly opposed by the insurance industry and most health care interests - a public, nonprofit insurance plan offered by the government - Baucus has been more ambivalent, saying he supports the idea but declining to specify in what form. Baucus's office supplied nearly 20 examples of stances he has taken in direct opposition to drug, insurance and banking interests that have donated to his campaign funds. He has supported importing lower-cost prescription drugs from Canada, allowing the government to negotiate for lower drug prices for Medicare recipients, funding research that would show when generic drugs are a better deal than brand-name drugs and reducing Medicare payments to private insurers by $13 billion over five years. His office also points to an April 2007 Wall Street Journal article in which Baucus was quoted as telling medical industry contributors at a fundraiser, "You should worry about me coming after you." Donnelly, the Campaign Money Watch director, says the proof on health care reform will be in the final product - and that he's not terribly optimistic. Health and insurance interests are clearly targeting Baucus and his Finance Committee, which often have shown themselves to be receptive to their influence, he said. "This debate on health care is a microcosm … that even after a 'change' election, how much the special interests view (Washington) as their fiefdom," Donnelly said. Supporters of national health insurance are even less optimistic, noting how Baucus, Obama and leaders in Congress won't even consider their proposal, which they believe would have broad public support. "I can't think of any reason other than fidelity to your donors, to explain why they would keep us out of the debate," said Young of the physicians group. "Until we get campaign finance reform, it will be very difficult to do anything to challenge the status quo (in health care), and the status quo had better be challenged, because it's a very bad status quo."